Soon Eagle athletic fans will be able to read about their team on the Los Angeles Times website via Varsity Video. The site will showcase original content, provided by Chaminade College Preparatory’s Eagle Business students. Chaminade was one of 15 schools in Southern California to receive the exclusive invitation to join Varsity Video. 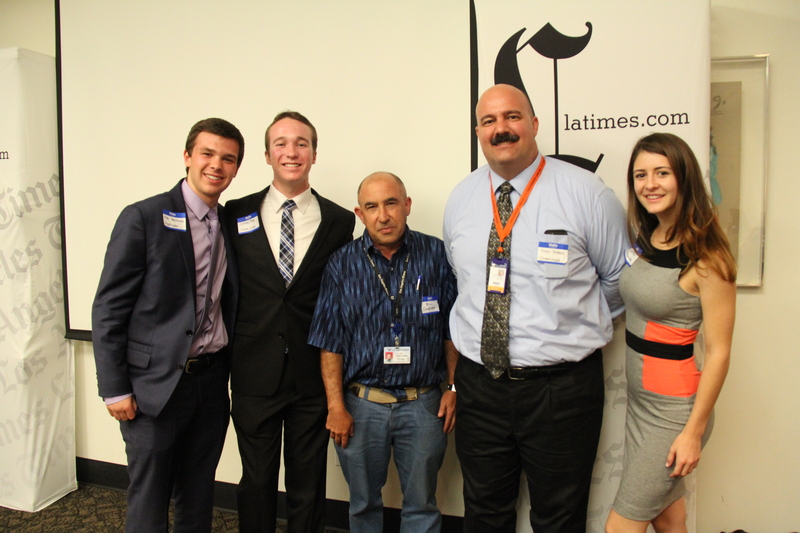 Last week, students Jen Harlow ’15, Conner Hoyt ’15, and Alec Neimand ’16 visited the LA Times office building in downtown Los Angeles to discuss this opportunity. The evening began with dinner and talks by the Times’ CEO, Austin Beutner and Deputy Sports Editor, John Cherwa. Times sports columnists, including Sam Farmer and Eric Sondheimer, met with the students and their teacher Aron Gideon to discuss ideas for creating content that represent unique perspectives of Chaminade athletics. After discussions and training for interfacing with the latimes.com website were completed, Eagle Business went on a private tour of newspaper’s three floors. The students have already begun to build their page. Find the Chaminade tab at Varsity Video at latimes.com in the coming weeks. If you have ideas for interesting athletics stories to tell, email eaglebiz@chaminade.org. To learn more about classes and programs offered by the Eagle Business Program, visit eaglebiz.org. There are nearly 50 members dedicated to Chaminade’s high school business program, which supports year-round enterprises such as Eagle Eye, Eagle Business Radio, and the PromeNade. This entry was posted in Academics, Athletics, Eagle Business, High School by Chaminade News. Bookmark the permalink.